THE WRITING BUDDHA - Opinions | Books | Movies: Inkredia - Luwan of Brida by Sarang Mahajan (Book Review- 4*/5) !!! 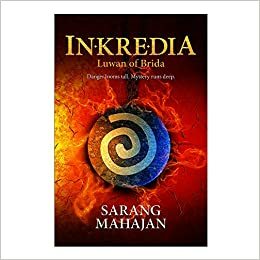 Inkredia - Luwan of Brida by Sarang Mahajan (Book Review- 4*/5) !!! The book related to fantasy world does not excite me much as I have not been a very good person with imaginations hence I fail to understand lot of things that are being described in such books. Till date, even after reading 500+ books, I have yet not picked up Harry Potter series just for the sole reason that the book belongs to the fantasy genre. But still there are few books belonging to the fantasy genre which have been rated quite high from my side just because they made it possible for me to feel that I am part of their world. Similarly, another book that has kept me busy this weekend in its world is “Inkredia - Luwan of Brida” which also has the tagline that says “Danger looms tall. Mystery runs deep.” The book is written by the author, Sarang Mahajan. Before proceeding with the review, let me clarify few words related to the title of the book that you have read above which might have confused you as none of the words are understandable. Inkredia here is the name of a very vast region. Brida is a small area in the region. Luwan is the name of the protagonist around whom the whole story revolves. The world created in this book is truly fantasizing. The way author has described things in details and makes sure that the reader feels himself intrigued in the world is commendable. Right from the first page, the narration is made in such a way that you cannot keep the book aside but read it in one go. The book is around 400 pages which took me two days to complete it with naturally multiple breaks due to weekend but whenever I was not reading the book, I was thinking about the protagonist and his elder sister about what would have happened to them. Such is the roller-coaster experience of reading this book. Unfortunately, this book still does not have a definite ending as it has more 3 parts to come. The description of assassins as a group of enemy is done very vividly. The characterization even in a book like this is done so emotionally and genuinely that you can feel for the characters and sympathize with them. The twists and turns come at the right time to always keep you thrilled throughout the journey of the story. Talking about the drawbacks, the only thing that comes to my mind is that the book could have been shorter by 50-60 pages as few segments are over-described which also makes the reader irritated and wants to skip lines in between. Otherwise, this book is a journey that you will keep fantasizing for a long time. I give this book 4 star out of 5. When will you read Quran by heart, Abhilash.?? It is the only book you will miss after leaving this world ��. Read by heart as God Almighty talking to you. And please do write your,true views, reviews after reading the best book on earth Quran the book of SIGNS. I reallr woukd like to know your true views after reading it by heart as God almighty directly having conversation with you. Thanks.. Waiting..